@copyright symbol 2012 Shopworks, Inc. In the last post we calculated the break-even point for an RMU business with one item in its product line. Although instructive, it’s hardly realistic. In this post we will look at an RMU business with a four items (the method is the same for forty items, or four hundred), each with a unique cost and retail price. In order to handle the added complexity of a product line with multiple items, we will need to calculate a gross profit that accounts for the revenue contribution of each item; the average gross profit. First, let’s look at the merchant’s sunglass products, now with four items. Since it’s an RMU business; we keep the retail prices at, or below thirty dollars, we make sure that most of the products provide a triple key gross profit margin, and that at least one item, style D, is truly a bargain which, when properly merchandised, will induce people to shop. From past experience, our merchant knows the sales of each style relative to the others. Knowing the sales mix is essential to creating an accurate model of the business. Naturally, the most expensive item has the lowest sales volume while the least expensive sells the most. 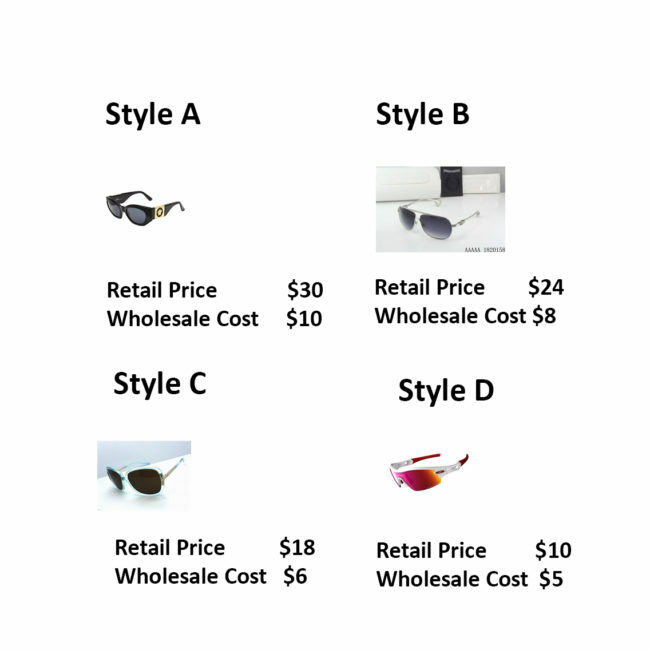 The sales ratios of styles A,B,C, and D are 1:2:4:8. He sells twice as many B units as A, four times as many C units as A, and so on. Use a weighted average to calculate an average that represents the gross profit of the entire product line. Subtract the 3% merchant banking fee and we get $15.33 – 3% = $14.87 for the average retail selling price. Now we know everything necessary to determine the merchant’s break-even point in units: break-even in units = fixed costs ÷ (selling price per unit – variable cost per unit). In our case the only variable costs are merchant banking fees (which we already subtracted out) and cost of goods sold. Break-even = $6,618 ÷ $8.87 = 746 units. Approximately 47 are style A, 98 are style B, 199 are style C, and 402 are style D.
If the estimated sales mix is accurate, this requires $14.87 x 746 units, or $11,093 in sales to break-even. Obviously the break even point goes down if the merchant sells a higher percentage of the more expensive models, or if some of the monthly expenses are reduced. More importantly, the results obtained here are based on a set of assumptions that accurately reflect the merchant’s knowledge of his business. The merchant must know enough about his business that he can identify fixed costs, variable costs, and the mix of products that he will sell in a given period of time. If there is no sales history available, the merchant must use all available resources to make a reasonable guess. If necessary, it’s very easy to test different scenarios. Naturally, the merchant must also follow through by presenting products with good value, that are well merchandised, and supported by attentive sales staff. Still, the best sales team in the world won’t produce a profit if the business’ cost structure is not well grounded. The break-even calculation helps ensure that the business’ finances are well grounded. This approach is not limited solely to determining the break-even point. It can be used just as easily to answer any number of what-if scenarios. For instance, the merchant might want to know what volume of sales might be required to generate a certain amount of income. Or, conversely, what income will result from a certain volume of sales. These are easy questions to answer using the approach presented here. For more information on how to harness the tools presented in this post, post a comment, or send us an email.